1. The friendly crocheters (and knitters) that I meet there. 2. The wonderful classes I get to take (when I’m not teaching) and the new things I learn about crochet (I love to learn more to expand my crochet knowledge and ability). 3. The market (show floor) with lots of gorgeous yarn, crochet hooks and patterns!!! 4. Professional Development Day where we learn more about earning an income through designing, technical editing, teaching, contract crocheting, etc. 5. Seeing and spending time with crochet friends that I’ve made over the years. 6. The Fashion Show dinner. I’ve been a CGOA (Crochet Guild of America) member for over 10 years and I’m hooked (pun intended)! There are so many wonderful, friendly, helpful crocheters in CGOA who are happy to share what they know with each other (mostly about crochet, but sometimes about life in general, too). I’ve made so many really good friends by attending the CGOA Conference each year. I am truly blessed to know so many crocheters from every walk of like, whether they’re professionals, associate professionals or CGOA members at large (these are the nicest people)! 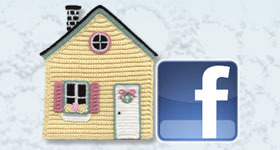 I love to encourage new crochet professionals and share my crochet knowledge with others through my classes. I certainly don’t know all there is to know about crochet, but I’m learning more all the time (and that’s what CGOA is all about…learning about crochet). I’ve been working on a shawl for this year’s CGOA Design Contest for several weeks. I can’t show you a picture of it because one of the judges might see it before the contest and the entries are supposed to be kept secret. But I can share with you the struggles and trials I’ve had designing this shawl (it’s confession time!). First, I made countless mistakes in this shawl and had to rip out a lot of stitches several times to correct the mistakes (I really should have been paying closer attention to what I was doing!). Oh well. Live and learn! Second, I ran out of yarn before the end of the shawl, so I had to frog (rip out) hours and hours of work on it so I can redesign it a little differently to use just the amount of yarn that I purchased last year at the conference (about 950 yards from the Newton’s booth). One of the “challenges” with this design (besides all of my mistakes and ripping out so many stitches) was the stitches that I worked into the chain spaces sliding around and not staying evenly spaced. The yarn I’m using is a rather slick mercerized cotton (not all mercerized cotton is slick like this one). I do enjoy the sheen this yarn has and the lighter weight of the yarn, so I’m willing to overlook the sliding stitches “challenge”! Can you see the difference? 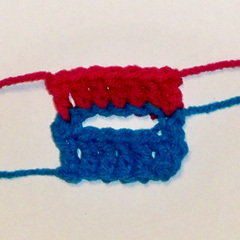 The photo on the left shows the center 5 red double crochet stitches worked in the blue chain-5 space below. 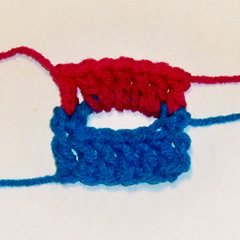 The photo on the right shows the center 5 red double crochet stitches worked in the chains of the blue chain-5 space below (one double crochet is worked in each of the 5 chains). Can you notice how the red stitches are more evenly spaced in the right-hand photo? And they don’t move around anymore. Of course, working into the chains themselves works best when you have the same number of stitches to work into the same number of chains (like 5 chains and 5 stitches). Well, I’d better get back to preparing for the conference. I hope you all enjoy the rest of this month and are able to enjoy many relaxing hours of crochet! This entry was posted in CGOA, Conferences, Crochet hints, Designing, Teaching classes and tagged CGOA, classes, conference, crochet hint, Designing, teaching. Bookmark the permalink.